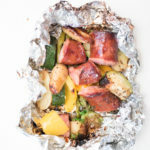 Foil packet dinners are an easy way to get a nutritious dinner on the table. Fill it with your favorite protein, whatever vegetables you have on hand, and seal it up real tight and place it on the grill or in the oven! Serve over rice or a bed of greens with a light vinaigrette or go ol’ ranch and keep the whole family happy. Preheat grill to med- high heat. Cut up all vegetable and protein and drizzle with olive oil and season with salt, pepper, and seasoning blend. Separate into equal portions. Ford up tightly in heavy duty foil packets. Cook for 15- 20 minutes or until sausage is cooked and potatoes fork tender.